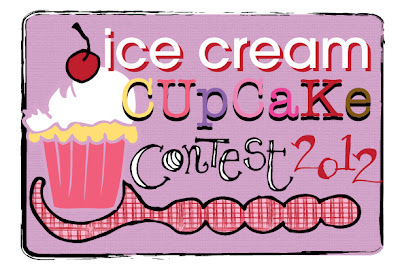 This is the contest that kindled my interest in perfecting cupcakes a year ago. It is what incited me to declare one of my 101 Things Challenges to be Year of the Cupcake, and bake a new cupcake each month for twelve months (Heheh. And I wonder why I have struggled with my weight this year...). Last year's effort was Thai Ginger Cupcakes, which featured a ginger base (which I seem to recall was pure bliss), and a scoop of vanilla ice cream﻿ on top rolled in toasted coconut and lime zest. Yummo spagummo. Looking back at last year's post, I cringe a little bit. I can probably blame most of the bad photography on the fact I took the photos indoors at night under fluorescent light, but the styling wasn't crash hot, either. Not that it's much better now (please ignore the green curtains in the background - they're the cheap ones mum made in the eighties and has been intending to replace them with cream-coloured roller blinds for quite a time, but, in true Mum style, this hasn't happened yet), but these days I make more of an effort to take photos in daylight. It doesn't always pan out that way, and sometimes I just need to eat it immediately so I point and shoot with a flash on, but I do try a little harder now to compose the photo. Plus I've realised the redundancy of taking photos of every damned step of the recipe, unless you are an awesome photographer (like Ree Drummond) or you have something interesting or quirky or important to say about the step. Ree does her cooking commentary well and is the reason I fell in love with that style of food blogging, but I don't think I'm quite up to her level. You know, quite. <--- UNDERSTATEMENT!!! 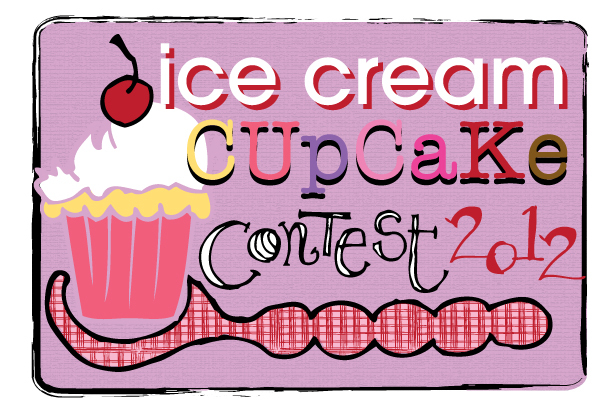 The rules for the Ice Cream Cupcake Contest include posting your cupcake recipe (which must include both cake and icecream elements) and photo; linking back to Stef over at TheCupcakeProject and Tina/Bethany/Kevin over at Scoopalicious; add your link to the bottom of Stef's competition page; and fill out the entry form. To preface the post, I will show you what we're aiming for. I actually went a little bit schmancy this year and combined three elements to make my Lemon Meringue Ice Cream Cupcakes, all of which were home-made: Cupcakes, ice cream and meringue. Oh, make that four - lemon curd, which was piped into the cupcake and also swirled through the ice cream. PART ONE: The ice cream. This should be done a couple of days in advance, I think. I began it the night before and as you will see in later photos, its structural integrity was somewhat questionable. This one's from Taste.com.au and was the only basic ice cream recipe I could find that a) required only the amount of cream I knew was already in the fridge, and b) didn't call for an ice cream maker (which I don't have. By the way, I have a big birthday coming up. Hint hint. And I like the colour red. Just in case anyone (like the people at Cuisinart, for example, or Kitchenwaredirect, who have received a wee bit of my income over the years) are listening... HAHAHA as if. Mind you, if they are listening, if they give me an ice cream maker I promise to blog my way through their recipe book! Yep, good thing dreams are free... and surely you can forgive me for dreaming, because my brain is a little fried at present on account of being precisely three weeks from the big 3-0. Denial is a beautiful place.). The lower layer is all chunky (albeit fine, soft chunks, like a porridge made of polenta), so I attacked it with the stick mixer and all was well in the world. Yep, world peace and the dissolving of world debt really is as simple as fixing your custard-y errors with a stick mixer. You're welcome. As I said before, leave plenty of time for the freezing part. It'll take longer than you think. Once it was (mostly) frozen I took about eight heaped spoonfuls out (one for each cupcake) and stirred through some crushed meringue and about 1/4 of the lemon curd. You want it to be frozen enough to hold its shape (unlike mine!) when it comes time to put it on the cupcakes. PART TWO: The lemon curd. Yields... I dunno, about 1/2-3/4 cup? Enough to fill some cupcakes with but not much more. I got this one out of my new cupcake book. Given I have to post this before I get home for the weekend I will have to forgo citing it for now, but promise to edit it in shortly. Beat egg yolks, sugar and lemon juice until combined. Add zest and stir. Place in heatproof bowl over saucepan of simmering water (don't let the bowl touch the water) and add butter. Stir with wooden spoon until butter melts and then keep stirring until it thickens into a custard, about four minutes or so. Push through a seive to get rid of the zest chunks (I may or may not have gathered them together out of the seive and sucked the residual lemon curd off it before discarding it... but nobody saw it so it probably didn't happen). Cover with plastic wrap to stop a skin forming and cool in refrigerator. Preheat oven to 130oC. Line tray with baking paper. Beat the first three ingredients until stiff peaks form. Fold in the icing sugar. ...pipe soft-serve-esque meringues to fit on the cupcakes. You will want to have some meringue left over to crush into the ice cream so if you pipe nine swirls and use the ugly one for the ice cream you'll be fine. Bake until they have dried out. The first clue is that they will move on the tray when gently pushed (wet meringue sticks), and the second clue is that they will feel light and sound hollow when the bottom is tapped. This will take 30-50 minutes. Keep an eye on them because you don't want them going brown - soft serve isn't brown! ... to gouge holes in the underside of the meringue. This is partly to quarry more meringue to stir through the ice cream and partly to allow the meringue to grip to it and not just immediately slide off. I guess you could probably use a paring knife (wow. Only took me eight goes to spell it correctly!) and a teaspoon, or perhaps a grapefruit knife, but this bladed spoon with a point did a good job of gently scraping at the meringue without stabbing myself, slipping or otherwise crushing the meringue or putting a hole through it. Go gently, grasshopper. This is a basic butter (cup)cake recipe from the AWW Cooking School cookbook. I divided the below recipe into thirds to yield eight cupcakes (so this one yields 24). Mine were a little overcooked so maybe check them before the stipulated 20 minutes is up. Preheat oven to 190oC. Do the usual - whip butter until light and fluffy, add sugar and whip until nice and combined, add eggs (don't over-beat), add flour and milk in 2 batches each, just combining (again, don't over-mix). Divide into 24 cupcake cases. Bake for a little under 20 minutes, until they spring back when touched. Remove from oven, cool 5 minutes in tin then turn onto rack. Once the cupcakes have cooled, the curd has set, the meringues are sorted and the ice cream is frozen, get your bismarck tip (yay! I know things! I imagine you could also do it with a round tip, or get that paring knife out again and cut little rounds out the top of the cake, squirt some curd into it with whatever tip you have, then replace the little round of cake) and stab each cupcake with it, wiggle it about a bit to make a cavity and then pipe the curd into the cupcake. I got a couple of squirts into each cupcake, and then dusted them with icing sugar in case someone didn't want to eat the cupcake fully assembled (scandalous I know, but it was a possibility. I also had to test the cupcakes to make sure they were up to snuff, so I can confirm that they taste good like this, even if they look a bit scrappy). Finally, get a spoonful of your (hopefully frozen!) ice cream, smear it carefully on the underside of the meringue and assemble the cupcake. It was a pleasing combination of sweet and tangy, and the competing textures made it a pure joy to eat. A messy joy. Note the melty ice cream sliding off my cupcakes - don't be me. I suspect that if the ice cream had been much harder, though, the meringue may have shattered when I applied the ice cream to it. It's a fine line! If I had my time again, I would make the ice cream a week in advance. Or I would just use store-bought vanilla ice cream and soften it on the bench before stirring through the crushed meringue and lemon curd. But altogether I'm pleased enough with them - how they tasted and how they looked - to post a second photo! PS - if you want to be a Cheaty McCheaterson, I can't see a reason that you couldn't just use packet mix cake and store-bought lemon curd and ice cream. I don't know whether you'll get the same quality product (unlikely) but if you're in a hurry, better to have Cheaty Cupcakes than no cupcakes at all! YUM but seems like so much work and I'm so lazy. HAHA! Yeah I usually am too. But packet mix + store-bought ice cream and lemon curd would go far to make it easier! Your meringues look beautiful! I enjoy the cupcake/ice cream in one idea, I may have to try this on my own sometime. Is this something that you assemble right before you serve, or can you pre-assemble and freeze the whole caboodle? WOW. I LOVE lemon meringue. Might have to make these SOON! My favorite part is your making the meringues, and scooping out the inside to mix it into the ice cream AND for a better grip. GENIUS! Thanks Bethany :) I see lemon meringue ice cream in your future!